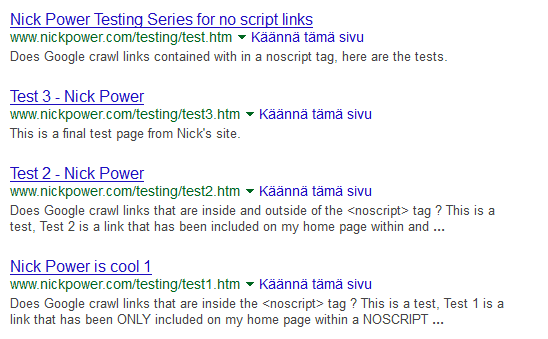 TEST 1 – Page with Just simply a NOSCRIPT block with a sentence and hyperlink in it. The idea of my tests was to see if Google would show any unwillingness to crawl any of the hyperlinks and prove a point that links inside a NOSCRIPT tag are not indexed. Google must give some consideration to links inside a NOSCRIPT tag, I’d be curious to know what the conditions are despite their recommendations on the Web Master Blog. Maybe my tests are flawed or I’ve messed them up ? Firstly, it’s bugging me to know and I’m sure many other SEO’s what to recommend to developers when they ask (well some Developers!!) about these issues. If I was to tell a developer that they could NOT use a NOSCRIPT tag, then they would have to spend time developing a complex work around solution I’m sure, before I do that, I want to be damn sure. So does this mean Page Rank is passed or distributed with a NOSCRIPT tag? On this round of tests, I have not tested this but this is still open to debate, I’d certainly be interested to know the answer to this question since this means that a majority of e-commerce engines use front-end code using pagination and lazy loading based on NOSCRIPT tags.